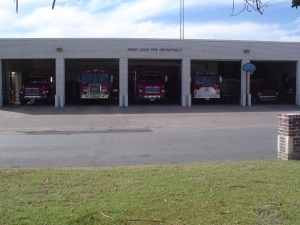 The River Oaks Fire Department Station 13 is located adjacent to City Hall at the corner of River Oaks Blvd and Glenwick Dr. 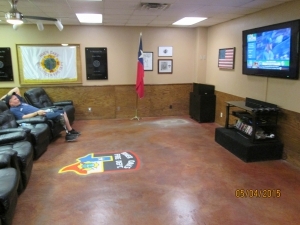 It features 5 bays for storing the fire fighting apparatuses and all the other accommodations typical to a modern fire department facility. 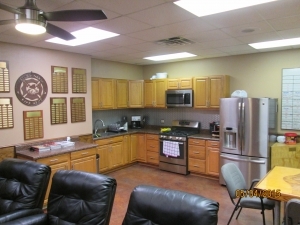 Our Kitchen includes most of the conveniences of home. Our Dining Area includes a Handmade table by retired Firefighter Scott White. 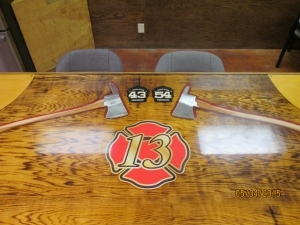 This firehouse table is a memorial to Asst. Chief Collins and Captain Dean who both died in the line of duty in 1999. 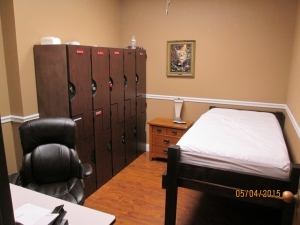 The Officer's Quarters include lockers, a bed, and a computer work station for filing reports and maintaining records. The Firefighter Bunkroom has room for five personnel and includes lockers and storage for sleeping items. 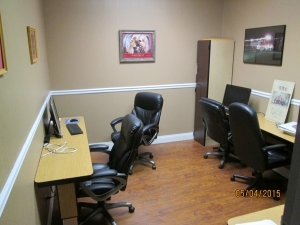 The Watch Office includes computer workstations and tables for studying or projects. It also includes a TV for monitoring the weather. This is also the storage area for radio and equipment batteries which are changed out daily.